(including alcohol) or we will assist you with various catering choices. No need to spend money on decorating as Confetti's is S.G. Savages Interior Design Showroom and is a beautiful and elegant space featuring; couches for comfortable seating, original art, vintage and new furniture, flower arrangements and accessories. Participants receive a special perk by attending your event/meeting as they may also browse and shop. 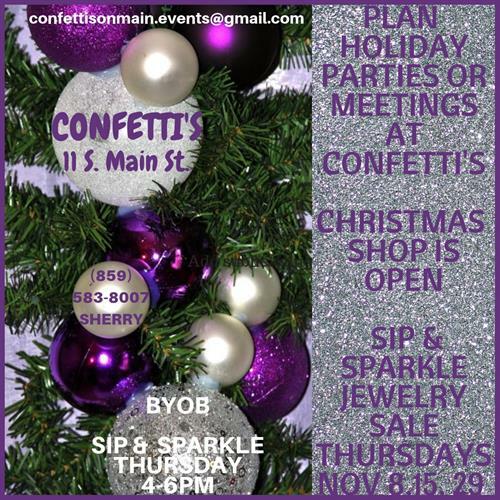 The Christmas Shop officially opens Nov. 8 and Thursdays from 4-6pm jewelry is on sale at Sip and Sparkle event, Nov. 8, 15 and 29. You can BYOB and enjoy light snacks while you select jewelry for yourself or gifts.